His SAAB 99 raced in 1977 came to him care of a violent accident, writing it off for road use, smashing a front wing, the opposite rear wing and bending the roof where it had rolled. A daunting task but a cheap competition rallycross car! Will doesn't mind a bit of hard work, being a heavy goods maintenance garage owner and mechanic he had all the tools he needs. Using panels from another SAAB crashed by a friend, welding torch in hand he beat the body back into shape. "We had a slack period at work so I went all out on the car and it was virtually completed, ready to compete in three weeks", said Will. Will managed to accomplish this because a lot of bits were already on the SAAB and a lot more bits on the Triumph Dolomite Sprint he was competing in last year. Coincidentally (not!) 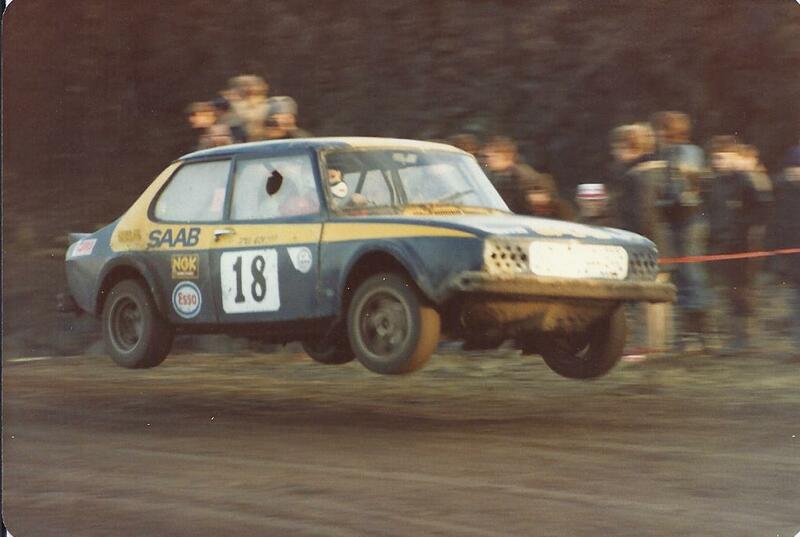 the Sprint engine fits straight into the SAAB because the Swedish firm use the Dolomite engine in all their cars. Last year's Dolomite season was very mediocre, finishing eighth, not what Will was used to! 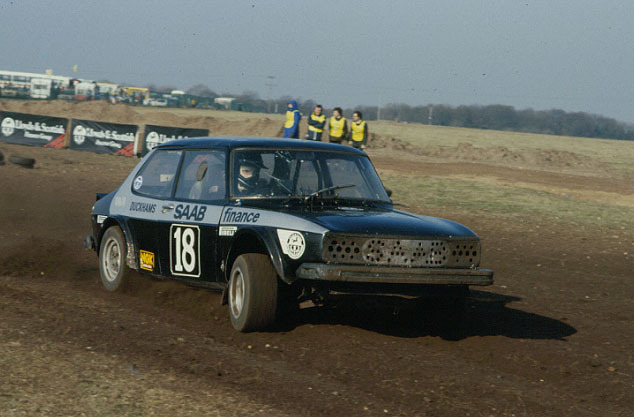 At this point Will had been competing in Autocross and Rallycross for about five years but had a lot of success within that time. 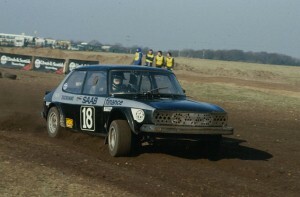 He originally competed in a Mini in 1972, winning the South Eastern Autocross Championship. He also managed a few 'Fastest Time of the Day (FTD) with car and, once, a glorious third overall in an open international event. So the Triumph was just not up to his standards. "It just wasn't competitive in near standard from, especially at international level and that is the level I'm interested in", said Gollop. So the Triumph eventually met its end in a Hot Rod race, after being persuaded into a post! In straightening the shell, all the interior and exterior trim was removed, including the standard tank. In went the roll cage from the Dolomite, which, surprisingly, went straight in with a few modifications, saving a few valuable quid and a lot of time. In building the shell, Will replaced all glass with perspex, the windscreen was laminated as standard. A glass fibre bonnet and boot followed. The SAAB was a heavy car as standard but minus all the trimmings and new panels, it weighed in at 18cwt, 3 above the minimum weight allowed to race. The engine was a standard Dolomite Sprint block, conveniently his standard 1850cc SAAB 99 was eligible for international competition too. The standard 1850cc engine included all parts as standard except the cylinder head, the parts are just balanced, not lightened or strengthened. The head ports were matched and smoothed out a little, the valve pockets were a bit larger and the whole head was polished. The standard shape of the head was basically a good design, valves remained standard and the cam was a Broadspeed Group 2 version. Twin 45DCOEs sit on a sportier inlet manifold from Leyland, supplied by S.A.H. Accessories. The exhaust manifold provided courtesy of Mike the Pipe and exhaust piping Will shaped himself. Will claimed the engine was running 175bhp at the flywheel when it was in the Dolomite and believed this was sufficient until he had learnt how to make the car go faster - handling wise. There were no oil-overheating issues and the deep, narrow standard sump was ideal and required no reshaping or baffling. The sump was protected by a home-made steel guard. 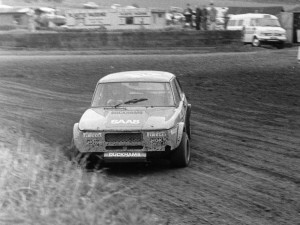 The SAAB ran a standard gearbox, accepting the 1850 and 2000cc Triumph engines as well as the 2000cc SAAB lump. However, the gearbox is the version used up to 1973 because Gollop's SAAB friend, Mr Stabler, developed a limited slip diff. He thought this would most likely to be used for competition because more modern ones were prohibitively expensive. 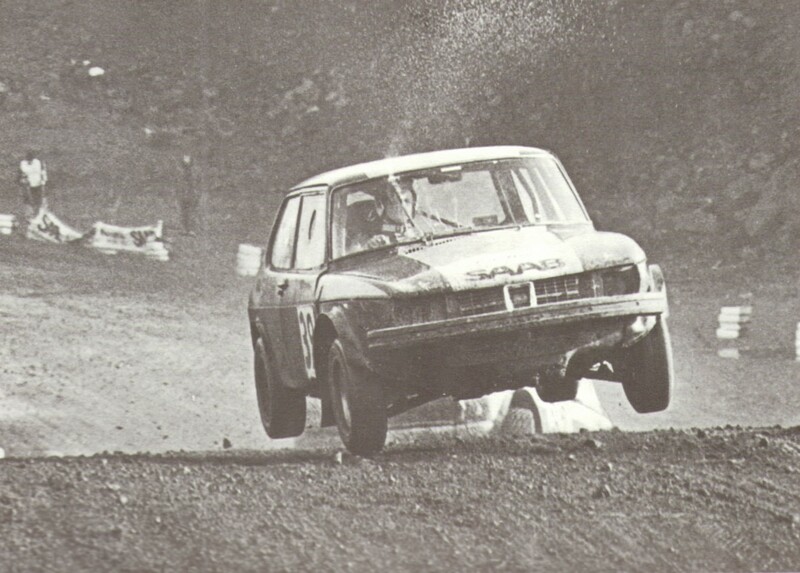 The standard driveshaft's from the 99 were used and proved adequately strong because the rally teams used them to good effect, with no significant breakdowns. The only problem with the driveshaft's is that they were the sliding type, Will reinforced the engine/gearbox mounts to ensure the unit does not move under competition strain and let a shaft slide too far. 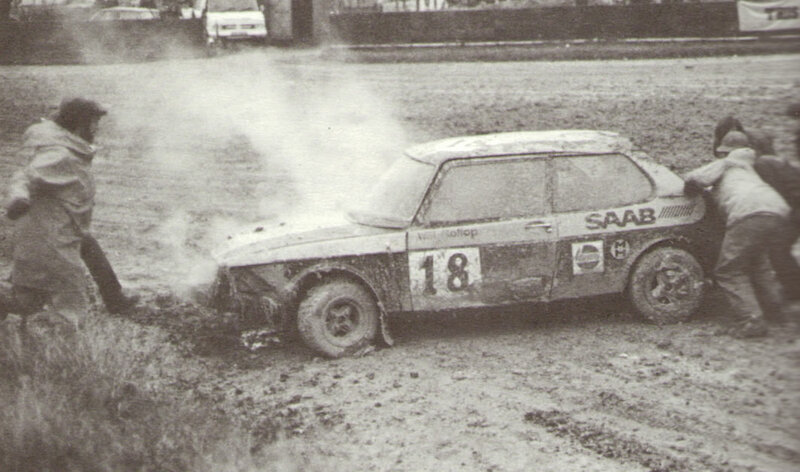 All other parts of the steering assembly were bog-standard SAAB. The front suspension were replaced with brand new SAAB competition springs, a worthwhile investment considering time saved. 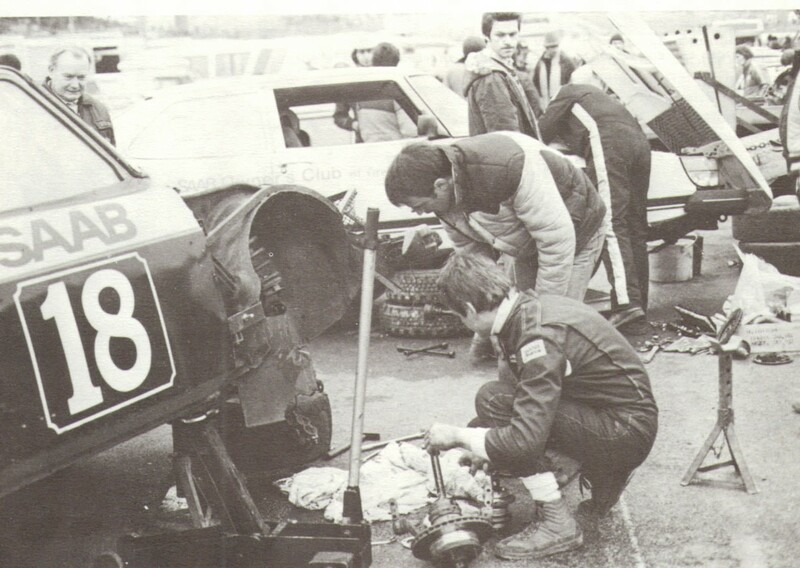 They are coupled with Schreider dampers, repeated at the rear. Aside from that, the suspension was untouched, including the beam axle. Gollop; "I plan to make a lot of changes at the rear. I aim to build an 'A' frame with rose joints, similar to the set up I had on my Mini, instead of the beam axle located by a Panhard rod at present. I will have to think about what effect losing the weight will have but I am keen to build a lighter, entirely new rear suspension set up". Another alteration away from standard are the 13 inch alloy wheels, which replace the 15 inch ones. This lowers the car considerably (Will thinks possibly too much) but it handles and performs well on them. However, as a result the brake callipers would not fit and required a slight tidying up of the casing. The SAAB had 9 inch discs, running with competition pads. The dashboard is home made, out of aluminium and contained the minimum of gauges - water temperature, oil pressure, rev counter and windscreen washers.